Pennsylvania and New Jersey were latecomers among the American colonies. True enough, there had been in their development a Swedish period and a Dutch period, but the real establishment of the two colonies had to wait for the time of the English "proprietors." It was in 1680 that William Penn received his famous grant of land from Charles II, as payment of a debt owed to Penn's father, the celebrated admiral. By this means Penn became sole proprietor of a colony which he foresaw as a place of refuge for his fellow Quakers -- the nonconformist sect whose faith earned them nothing but contempt and persecution in England (as well as in most of the established American colonies). Before he set out in 1682 he sent ahead a government plan of his own devising, and also a number of representatives to map out a city to be called Philadelphia. Penn's concept of government was extraordinarily liberal, in many respects tantamount to a genuinely democratic scheme; moreover, he guaranteed complete freedom of worship, and delegated much more administrative authority than any other of the colonial governors saw fit to allow. Penn understood the wisdom of securing friendly relations with the Indians from the start. In 1683, he established a "Great Treaty" with them. 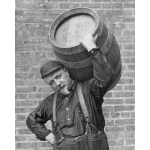 In exchange for property rights which they were willing to grant him, he made a practice of giving them a variety of goods -- in at least one instance, a barrel of beer. Shortly after Penn's arrival, an Assembly was held in Chester, the former Swedish settlement of Upland. At this meeting his Frame of Government was adopted; and there were also laid down certain laws regulating the licensing of taverns, taxing of beer, sale of alcoholic beverages to Indians, etc. Such laws were sooner or later passed in every one of the American colonies and differ only in the merest details. Penn himself was enough of a beer-drinker to have a brewhouse constructed at the estate he built in Pennsbury, Bucks County, twenty miles upriver from Philadelphia. At a cost of about £7000 and over a period of many years, the manor-house was erected under Penn's supervision, although he was most of that time back in England. He made a start on the project soon after his arrival in 1682, but he had to return to England in 1684. He commissioned his trusted friend James Harrison as "Steward of the Household at Pennsbury," and from that date until his return, he wrote frequent letters, filled with details about the house's specifications, the gardens, the servants, slaves, etc. "I would have a Kitchen," he wrote from London after he returned there in 1684, "two larders, a wash house & room to iron in, a brew house & in it an oven for bakeing." During the following two years he felt the need to repeat these instructions, which in time were fulfilled. Penn was not able to see the results at Pennsbury until 1699. At that time, as things turned out, he remained only a year; thus he spent in all only three years in America. Nonetheless, he made good use of Pennsbury while he was there; "Indians almost every morning were waiting in the hall, seated on their haunches." Penn also entertained in that house the governors of Maryland and Virginia, as well as what are usually referred to as "visiting dignitaries." None of Penn's descendants cared for the house as the proprietor himself had, and it was permitted by sheer neglect to go to ruin. It was finally torn down at the time of the Revolution, but somehow the brewhouse structure managed to survive until 1864. It is described as being 20 by 35 feet, "with solid brick chimney and foundations, 10 inch sills and posts, and weatherboarded with dressed cedar." That there was beer in the earliest stages of Philadelphia's settlement is attested to by the immigrant Thomas Paschall in 1683: "Here is very good Rye . . . also Barly of 2 sorts, as Winter and Summer, . . . also Oats, and 3 sorts of Indian Corne, (two of which sorts they can Malt and make good beer as Barley)." "Our DRINK has been Beer and Punch, made of Rum and Water: Our Beer was mostly made of Molasses, which well boyld, with Sassafras or Pine infused into it, makes very tolerable drink; but now they make Mault, and Mault Drink begins to be common, especially at the Ordinaries and the Houses of the more substantial People. In our great Town there is an able Man, that has set up a large Brew House, in order to furnish the People with good Drink, both there and up and down the River." Farther along in the same document, he identified this "able man" as William Frampton, and to demonstrate the first Philadelphia brewer's prosperity, he added that Frampton had recently built "a good Brick house, by his Brew House and Bake House, and let the other for an Ordinary." Frampton -- Quaker, merchant, provincial councillor and landowner -- originally emigrated to New York and did not arrive in Philadelphia until 1683. If he was as prosperous as Penn makes out, he did not enjoy this state for long: he died in 1686. In those early days of Philadelphia, many inhabitants are said to have owned their own malt-houses in order to make strong beer at home, and Gabriel Thomas stated in his account of the town (as of 1696) that there were three or four "spacious malt-houses, as many large brew-houses." Thomas, a Welsh pioneer who lived in the colony for fifteen years, also described Philadelphia beer as "equal in strength to that in London," selling for 15s. the barrel -- cheaper than in England. In addition, he speaks of Philadelphia beer as having a "better Name, that is, is in more esteem than English Beer in Barbadoes and is sold for a higher Price there." This would be an extremely early, if not the first, instance of American beer being exported outside of the mainland, though there is no indication of the regularity or volume of business thus entailed. In the course of the eighteenth century, Philadelphia beer began to make a resounding reputation for itself: the origins of that fame may lie right here, in this remark of Thomas's comparing the beer favorably with the English product. On the other hand, Thomas's unbridled enthusiasm must not be discounted -- he may very well have been trying to paint the prettiest possible picture of conditions in America, and particularly Pennsylvania. Another brewer of this earliest Philadelphia period was Joshua Carpenter, whose brother, Samuel, had come over from England several years before Penn's arrival. Samuel Carpenter, a Quaker, was responsible for building Philadelphia's first wharf, between Walnut Street and Dock Creek. Joshua, who had followed his brother to Philadelphia some years later and who was himself not a Quaker, did so well out of his brewing enterprise that he was rated as the second richest inhabitant of the town in 1693; his brother was first. The brewery established by Anthony Morris in 1687, south of Walnut Street, on the riverbank side of Front, was a longer-lasting establishment. Morris (the second of his name) was another Quaker, provincial councillor and second mayor of Philadelphia. He had sailed for America in 1682, and settled first in Burlington, New Jersey. Three years later, however, he went to Philadelphia, and soon set up his brewery there. His son, Anthony, Jr., prepared himself for the business by becoming in 1696 an indentured apprentice to another brewer operating in Philadelphia at that time, Henry Babcock. It was stated in the indenture that he was to spend seven years learning "the art or trade of a Brewer." He undertook to keep the brewing "secrets" of Babcock and his wife Mary, "& from their service he shall not absent himself, nor the art & mystery of brewing he shall not disclose or discover to any person or persons during ye sd term." His father paid the Babcocks the sum of twenty pounds, and they undertook not only to teach him for seven years, but also to lodge and board him, and "mending of his linen & woolen cloaths." They on their side promised not to put him to "slavish work," such as grinding at the handmill and the like. It must have been this younger Anthony Morris who signed his name, "Morris junr," at the bottom of a receipt that read: "Reed of Hannah Ring Eighteen Shillings for barrel Ale delivered for funeral of her husband 7mo 4th 1731." The Morris brewery was conducted as a family business, handed down from generation to generation, until 1836, when ownership of the concern was taken over by outsiders. Through marriage with the Perot family of French Huguenot background, however, the Morrises have maintained an unbroken connection with the brewing industry. In 1823 Francis Perot married the daughter of Thomas Morris, in whose brewery he had spent six years as apprentice. With brothers, sons and then grandsons in charge, the Perot family have been malting in Philadelphia ever since. Pennsylvania had made an encouraging, even a spectacular, beginning. It had grown like a balloon; within twenty years, by the end of the century, its main city had a population equal to that of New York (4000). And yet, after about twenty-five years, it began to bog down. Penn died in 1718, but a good many years before that he had relinquished personal control of the province, while remaining proprietor. Relations with the Indians deteriorated; boundary conflicts, like sores, kept irritating the relations between Pennsylvania and her neighbors; and the fine promise of commercial prosperity had been disappointed. The bold Philadelphia printer, Andrew Bradford, was hauled before the Council in 1721 for publishing a pamphlet called "Some Remedies proposed for the restoring of the Sunk Credit of the Province of Pennsylvania." He was reprimanded for so-called libelous statements. Yet at the same time, the Council, under Governor Sir William Keith, passed laws designed to improve just those conditions which it had called untrue in Bradford's case. Among those was an act "for laying a Duty on Wine, Rum, Brandy and Spirits, Molassoes, Cyder, Hops and Flax, imported, landed or brought into this Province." The self-evident purpose of an act like this was to give aid to home manufactures and, by placing a duty on imported hops, of course, the Council encouraged Pennsylvania farmers to cultivate them locally. Another reason for this act was undoubtedly the wish to cut down supplies of beverages with high alcoholic content, in favor of beer (which did not appear among the list of dutiable items) -- but the barn door may have been closed too late, for by the eighteenth century rum was universally available in America, and increasingly popular. Acts of the same kind were passed at intervals by the Provincial Council -- in 1738, 1744, etc. -- but they appear to have been less than wholly effectual. Read more about Stanley Baron's landmark book, Brewed In America. Brewing In Colonial America by Gregg Smith.